NewSpace is the only conference that brings the three pillars of the space industry — startups, established companies, and government agencies — together with private investors and tech innovators. The three-day conference focuses on the current, near term, and future issues and challenges in commercial space and is attended by distinguished members from all sectors and verticals of the space industry, making this conference a hotbed of innovation and partnership. NewSpace 2016 will be held June 21-23. For the first time ever, the conference will take place in Seattle, Washington - the cradle of aerospace innovation and now a growing space cluster. Proceedings will be held at the Motif Seattle Hotel in the heart of downtown Seattle. The NewSpace Conference is hosted by the Space Frontier Foundation, a 501(c)3 non-profit committed to realizing the vision of a greatly expanded and permanent human presence in space. The Foundation functions like a city Chamber of Commerce for the space industry, interfacing between smaller private entities, government, and larger industry giants as well as encouraging and supporting collaboration between them. The Foundation believes that privatizing space exploration will lead to faster innovation and progress, smarter financial decisions, and job creation, and that the public and private sectors must work together with the former incentivizing the latter. The power of free enterprise will be the catalyst to generate the necessary technologies for humans to live and work in space and sustain a healthy, thriving space economy. 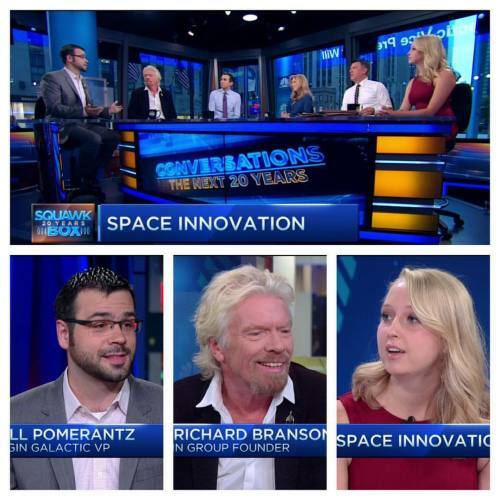 Space Frontier Foundation Executive Director, Hannah Kerner, speaking with with Richard Branson & William Pomerantz of Virgin Galactic on CNBC’s Squawk Box about the commercial space industry and young entrepreneurship. “The future of space exploration doesn’t only belong to government. It also belongs to industry, entrepreneurs and even academia. Participation in entrepreneurial focused activities such as the NewSpace Conference is an important way that NASA can help support the transition of space capabilities to the private sector."